UPDATED: With the backing of 85 percent of the Texas House, San Antonio Republican Joe Straus was re-elected to his fourth term Tuesday. Straus drew 128 votes for re-election against challenger state Rep. Scott Turner, R-Frisco, who drew 19 votes. With the backing of 85 percent of the Texas House, San Antonio Republican Joe Straus on Tuesday was re-elected to his fourth term. Straus drew 128 votes for re-election against challenger state Rep. Scott Turner, R-Frisco, who drew 19 votes. Turner had worked for the last year campaigning to unseat Straus with the backing of a coalition of Tea Party and conservative groups, all of whom viewed Straus as insufficiently conservative. Addressing a House chamber packed with representatives and their family members and guests, as well as Lt. Gov.-elect Dan Patrick and Gov.-elect Greg Abbott, Straus made a veiled reference to conservative groups such as Empower Texans, which have become a fixture in Republican primaries by promoting scorecards that rank lawmakers on their conservatism. Straus supporters have described some of the rating systems as misleading. “This House belongs to no special interest, no single interest. It belongs to almost 27 million Texans, all of the people we represent, and their scorecard is the only one that matters,” Straus said, prompting a standing ovation from a majority of House members. In a speech after losing his bid for speaker, Turner expressed concerns that his House colleagues lacked proper ambition to truly improve the state, suggesting that his challenge of the House leadership was an effort to change that. With his election to a fourth term as speaker, Straus has now served longer than his predecessor, Republican Tom Craddick of Midland, who served three terms. He’s also served longer than every other previous Speaker in the state’s history save for three: Pete Laney and Gib Lewis each served five terms, and Bill Clayton served four terms. Straus also said the House would “work to end abuses by those who grant and receive state contracts,” a reference to the mushrooming scandal at the Health and Human Services Commission over no-bid contracts. Turner cited border security as a "top priority" for the session. "It’s a war zone, and protecting the lives of our citizens is not a Republican or a Democratic issue,” Turner said. Prior to the vote, eight House members made speeches — four for Straus and four for Turner. 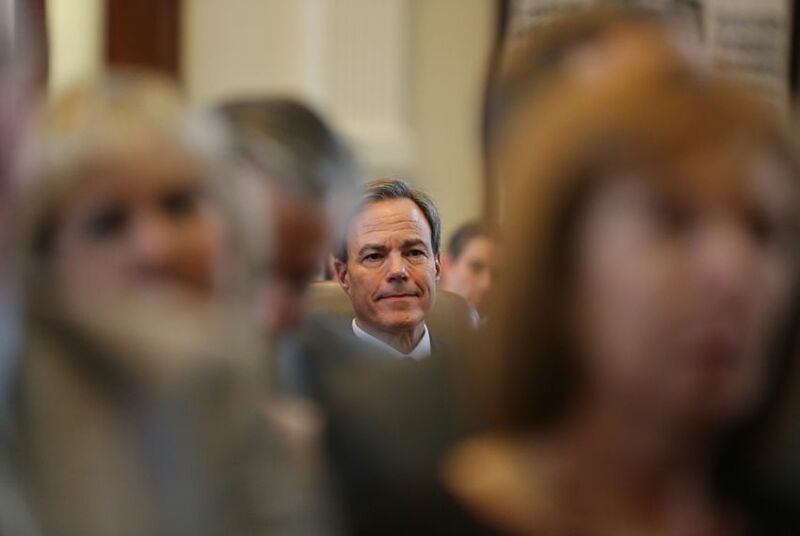 Straus supporters praised his steady hand and the chamber’s list of accomplishments over the past six years. In a speech supporting Straus, state Rep. René Oliveira, D-Brownsville, cited the state’s new leadership and the dropping price in oil as reasons why the House shouldn’t elect a new speaker. In nominating Turner, state Rep. Jeff Leach, R-Plano, said Turner had the natural talent to unite the House and move it in a fresh direction. Addressing concerns that Turner, who has one term under his belt, lacks the experience to be speaker, state Rep. Matt Krause, R-Fort Worth, noted that Abraham Lincoln served just two years in Congress before becoming president. In addition to Leach, Krause and Turner, the members who voted for Turner were Republican state Reps. Rodney Anderson, Dustin Burrows, Pat Fallon, Bryan Hughes, Mark Keough, Stephanie Klick, Matt Rinaldi, Scott Sanford, Matt Schaefer, Matt Shaheen, David Simpson, Stuart Spitzer, Jonathan Stickland, Tony Tinderholt, Molly White and Bill Zedler. Almost a year ago to the day, Turner launched his bid for speaker. Early on, he told members that he planned to keep his campaign going until the vote for speaker on the first day of the session, regardless of whether the race was still considered competitive. Before Monday, the House had not held a contested vote for Speaker since 1975. His campaign drew the support of Tea Party activists from across the state, as well as the support of the executive committees of more than 10 county Republican parties. Dozens of Turner supporters showed up to the Capitol on Tuesday to support his bid for speaker, many clad in white T-shirts. In his speech supporting Turner, state Rep. Scott Sanford, R-McKinney, praised Turner for getting Texans involved and invested in the vote for speaker. “The people, now educated, will not simply surrender their voices, and this is a good thing,” Sanford said.